How difficult it is to summarize briefly the contribution of these papers was brought home to me very clearly after Franco Modigliani was awarded the Nobel Prize in Economics, in part—but, of course, only in part—for the work in finance. The television camera crews from our local stations in Chicago immediately descended upon me. "We understand," they said, "that you worked with Modigliani some years back in developing these M&M theorems, and we wonder if you could explain them briefly to our television viewers." "How briefly?" I asked. "Oh, take 10 seconds," was the reply. Ten seconds to explain the work of a lifetime! Ten seconds to describe two carefully reasoned articles, each running to more than 30 printed pages and each with 60 or so long footnotes! When they saw the look of dismay on my face, they said, "You don't have to go into details. Just give us the main points in simple, commonsense terms." The main point of the cost-of-capital article was, in principle at least, simple enough to make. It said that in an economist's ideal world, the total market value of all the securities issued by a firm would be governed by the earning power and risk of its underlying real assets and would be independent of how the mix of securities issued to finance it was divided between debt instruments and equity capital. 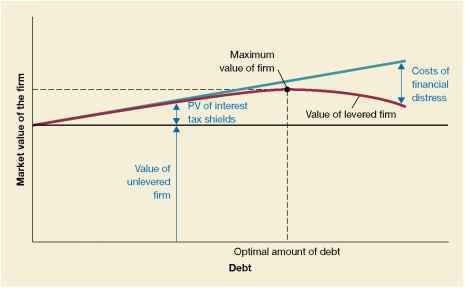 Some corporate treasurers might well think that they could enhance total value by increasing the proportion of debt instruments because yields on debt instruments, given their lower risk, are, by and large, substantially below those on equity capital. But, under the ideal conditions assumed, the added risk to the shareholders from issuing more debt will raise required yields on the equity by just enough to offset the seeming gain from use of low-cost debt. Such a summary would not only have been too long, but it relied on shorthand terms and concepts that are rich in connotations to economists, but hardly so to the general public. I thought, instead, of an analogy that we ourselves had invoked in the original paper. "Think of the firm," I said, "as a gigantic tub of whole milk. The farmer can sell the whole milk as is. Or he can separate out the cream and sell it at a considerably higher price than the whole milk would bring. (Selling cream is the analog of a firm selling low-yield and hence high-priced debt securities.) But, of course, what the farmer would have left would be skim milk, with low butterfat content, and that would sell for much less than whole milk. Skim milk corresponds to the levered equity. The M&M proposition says that if there were no costs of separation (and, of course, no government dairy support programs), the cream plus the skim milk would bring the same price as the whole milk." The television people conferred among themselves for a while. They informed me that it was still too long, too complicated, and too academic. "Have you anything simpler?" they asked. I thought of another way in which the M&M proposition is presented that stresses the role of securities as devices for "partitioning" a firm's payoffs among the group of its capital suppliers. "Think of the firm," I said, "as a gigantic pizza, divided into quarters. If, now, you cut each quarter in half into eighths, the M&M proposition says that you will have more pieces, but not more pizza." Once again whispered conversation. This time, they shut the lights off. They folded up their equipment. They thanked me for my cooperation. They said they would get back to me. But I knew that I had somehow lost my chance to start a new career as a packager of economic wisdom for TV viewers in convenient 10-second sound bites. Some have the talent for it; and some just don't. The late Merton H. Miller was famous for his pathbreaking work with Franco Modigliani on corporate capital structure, cost of capital, and dividend policy. He received the Nobel Prize in Economics for his contributions shortly after this essay was prepared. Notice in Figure 17.3 that the WACC doesn't depend on the debt-equity ratio; it's the same no matter what the debt-equity ratio is. This is another way of stating M&M Proposition I: the firm's overall cost of capital is unaffected by its capital structure. As illustrated, the fact that the cost of debt is lower than the cost of equity is exactly offset by the increase in the cost of equity from borrowing. 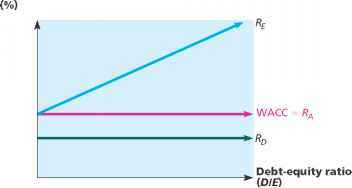 In other words, the change in the capital structure weights (E/V and D/V) is exactly offset by the change in the cost of equity (Re), so the WACC stays the same. -:—' The Ricardo Corporation has a weighted average cost of capital (ignoring taxes) of 12 percent. It can borrow at 8 percent. Assuming that Ricardo has a target capital structure of 80 percent equity and 20 percent debt, what is its cost of equity? What is the cost of equity if the target capital structure is 50 percent equity? Calculate the WACC using your answers to verify that it is the same. In the second case, verify that the debt-equity ratio is 1.0, so the cost of equity is 16 percent. As we have calculated, the WACC is 12 percent in both cases. The equity risk that comes from the nature of the firm's operating activities. The equity risk that comes from the financial policy (i.e., capital structure) of the firm.